Reports emanating from Korea have claimed that Samsung has encountered problems with the production of flexible screens for mobile devices. DDaily has brought word from an "industry official" who said the mobile giant has decided to delay the production of the bendy AMOLED display due to "problems with the yield." The source claimed that if Samsung can sort out the production issues by the end of 2012, there's a chance that the first flexi-smartphones may still arrive sometime during the first half of 2013. This will, of course, encourage completely baseless speculation that the first device to boast the tech could be the Samsung Galaxy S4. Samsung has been one of the key players in developing this bendable, twistable, and near-indestructible screen tech, along with the likes of Sony and Nokia. This time last year a Samsung representative claimed that the first flexible devices would arrive sometime in 2012, but it now seems that pledge is not going to come to fruition. In December 2011 the company released a concept video showing off its bendy AMOLED screen tech, while in May this year the company claimed there was "huge" demand for the tech from its partners. 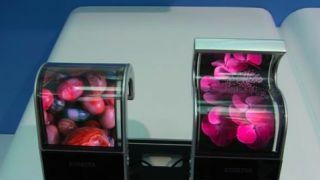 "We will be mass producing flexible OLED displays from the latter half of this year as the demand from our clients is significant," Samsung Electronics' vice chairman Kwon Oh-hyun said at the time.